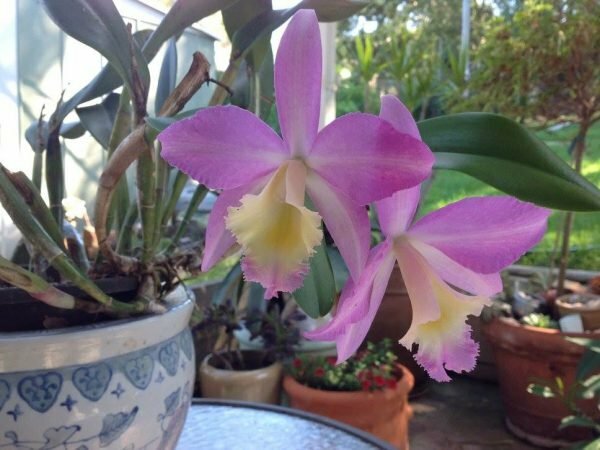 Here is my 20 most reliable and best performing plants list. There is something there to suit everyone. There are a lot more really nice plants, of course, however these are ones I have found to be popular and almost bullet proof. 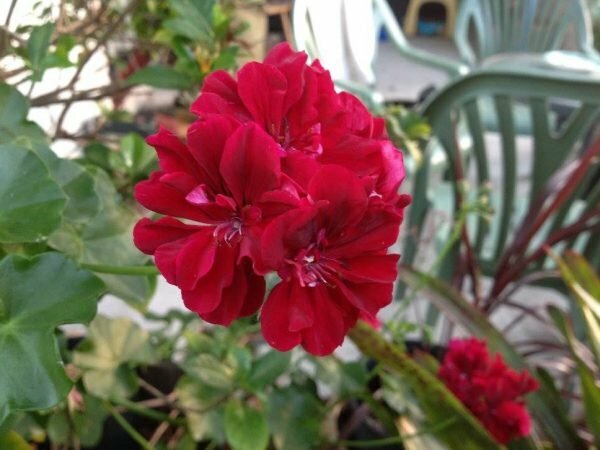 A reasonably compact flowering plant, which delivers dark red flowers in abundance. 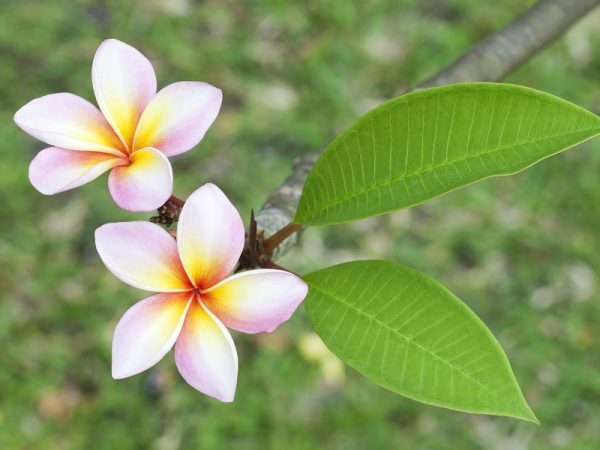 In sunny positions, particularly ones with afternoon sun, it will flower all year long. 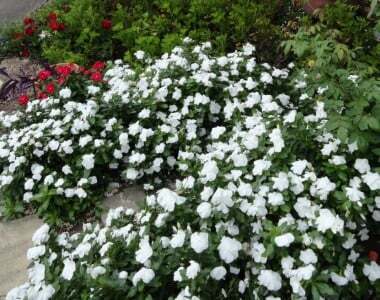 These plants grow to look just like white New Guinea Impatiens but they are many times tougher. They produce masses of white flowers in the warm months and grow as a small compact bush. 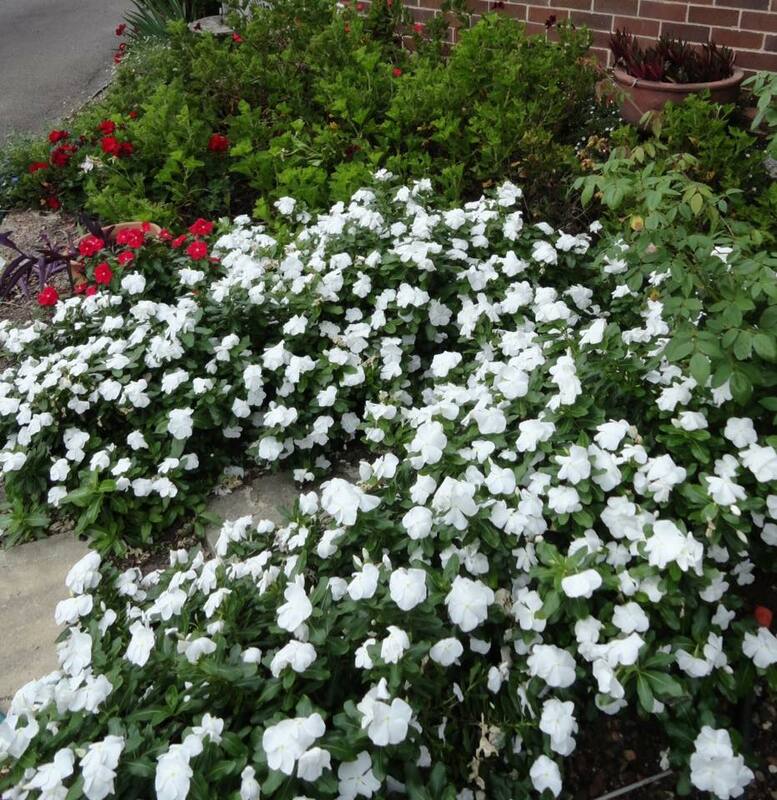 White flowers act as highlights in gardens and look great against other plants & green shrubs. 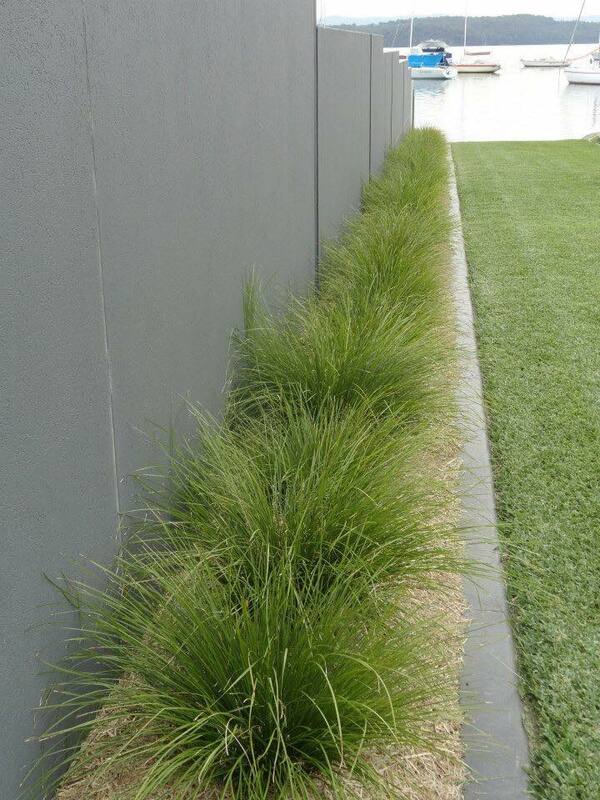 This is one of my favourite low border plantings which can double as a groundcover. 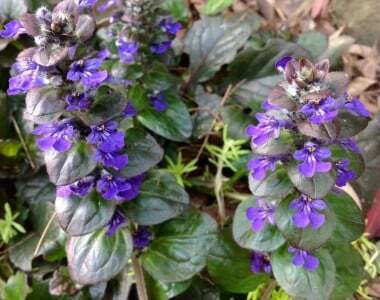 It has attractive dark leaves and mauve flowers and it will multiply well when it has good conditions. These have the rather unfair nickname of ‘McDonald’s plants’, due to the fact that they seem to be planted at every one of their store gardens. 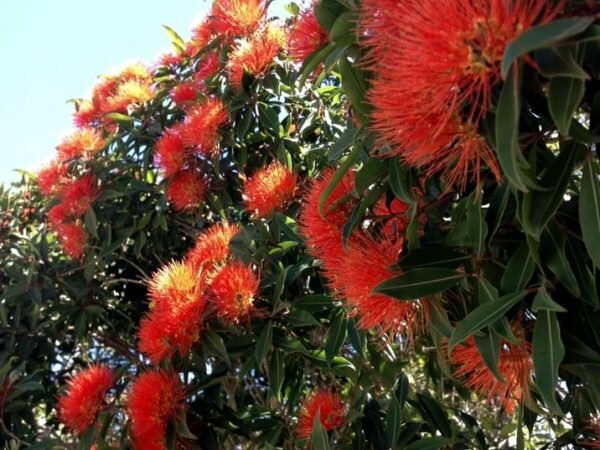 However, they have attractive red and green foliage and are low growing bushes; often used as a bushy hedge; benefiting well from regular pruning. 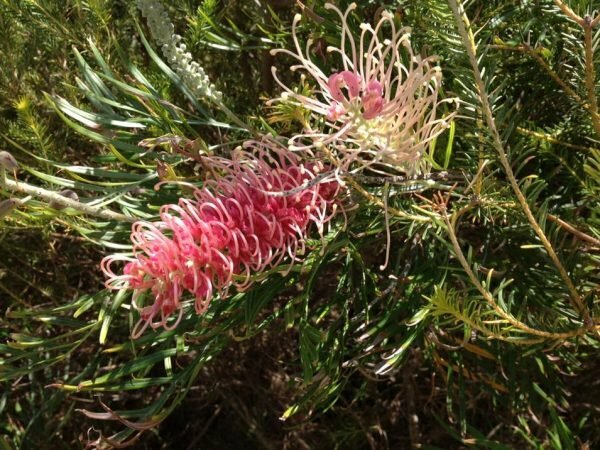 They are tough and usually grow well provided they are not competing for water with large nearby shrubs or trees and do better if not in a dry garden. They can be grown in pots and used as a portable hedge. Box hedge make a fantastic formal hedge up to a metre high, so it’s about that formal look, not privacy. 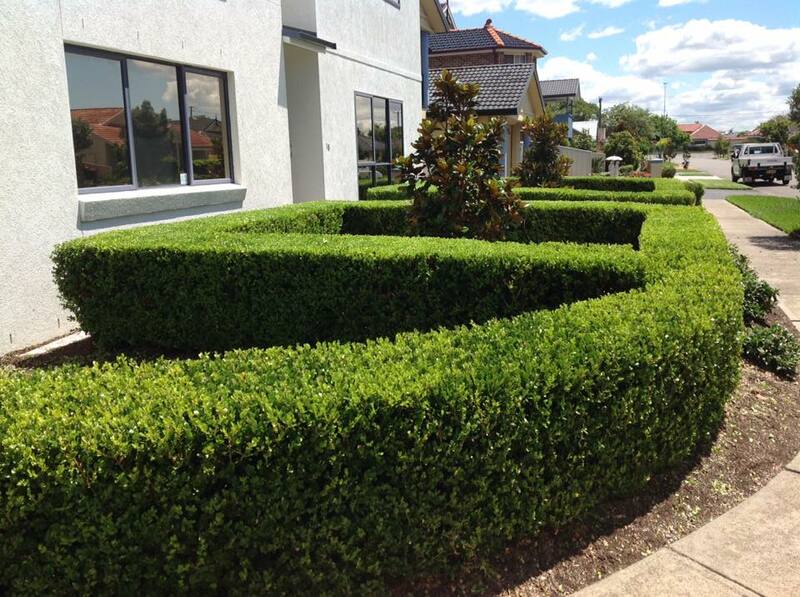 Make sure you are aware that lots of hedges mean a lot of work over a long time. However, if it’s a hedge you want, these look very smart. 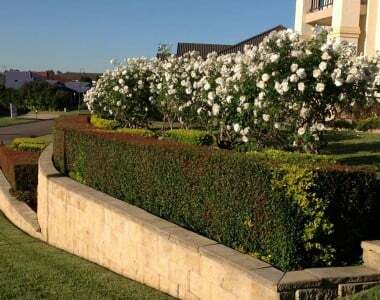 There are a few Box hedge plants, so be careful not to be confused about the one you want. This variety is the most hardy and responds well to trimming. All Buxus are dreadfully slow to establish, so you need to be aware that it’s not going to grow into a hedge until about 5 years or so, depending on the aspect, climate, soil and water your hedge plants are subject to. 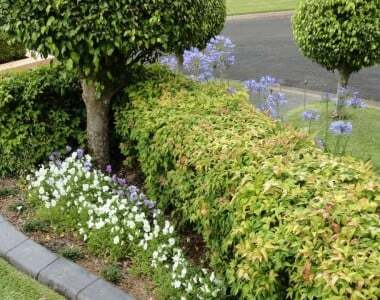 Remember that regular light trimming while establishing makes a hedge a hedge, rather than an assortment of messy shrubs. 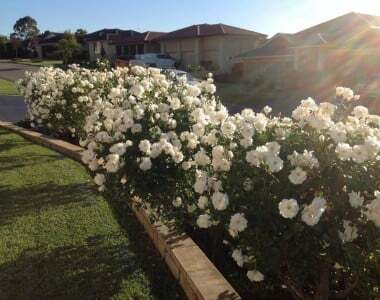 This is a good choice for a privacy hedge with occasional scented white flowers. It’s maintenance requirement for hedge trimming, on average, is between each 6 to 12 weeks in the warm months; though it can be kept looking very neat if trimmed more often. If left to grow, Murraya can get to beyond 3 metres high. 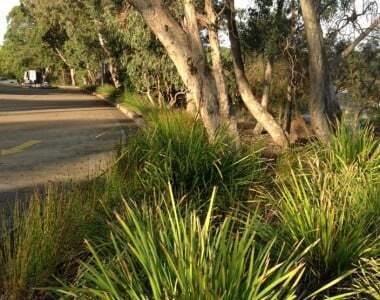 Should it become overgrown, it can be lopped and brought back into shape. All that is required is reasonable soil and soil moisture. 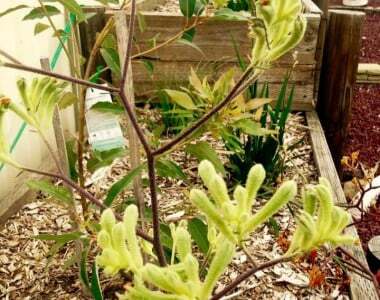 If the soil is poor, Murrayas can become stunted with yellow leaves. Often, a good dressing of organic manures and a thick layer of mulch will fix this problem. 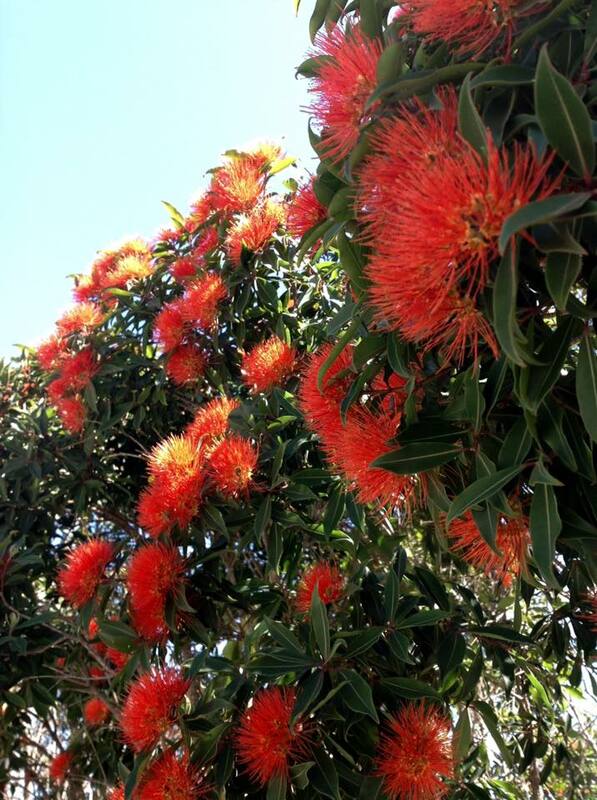 These grow to a small to medium sized tree if unpruned. 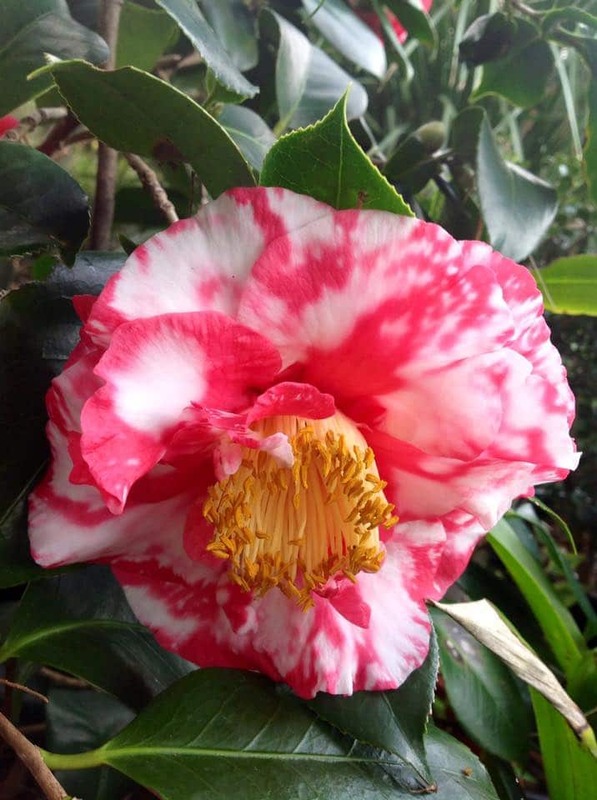 They are very tough and produce magnificent displays of flowers in many different shades of red, mauve, crimson, pink and white. They are deciduous, so they are bare in the winter. However, the trunks and branches have exquisite bark. Also the seeds attract parrots, such as Rosellas. One possible downside is that they resent root disturbance and will sucker beyond their location as a result. So you need tro choose carefully before you plant these. 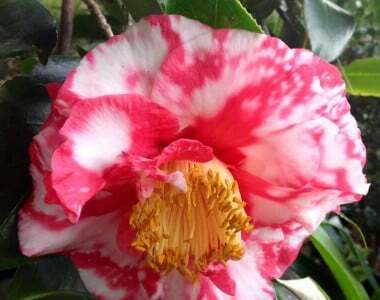 Camellias make the list because they are such wonderful cool season flowering shrubs / small trees. 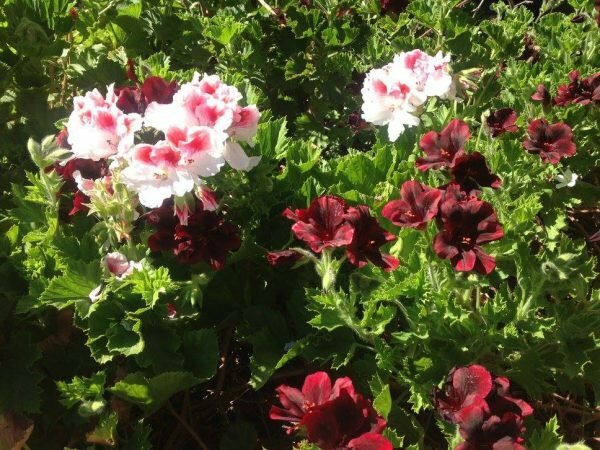 Their flowers come in a great variety of colours and the leaves are usually a healthy dark green.They go with that old world charm look. 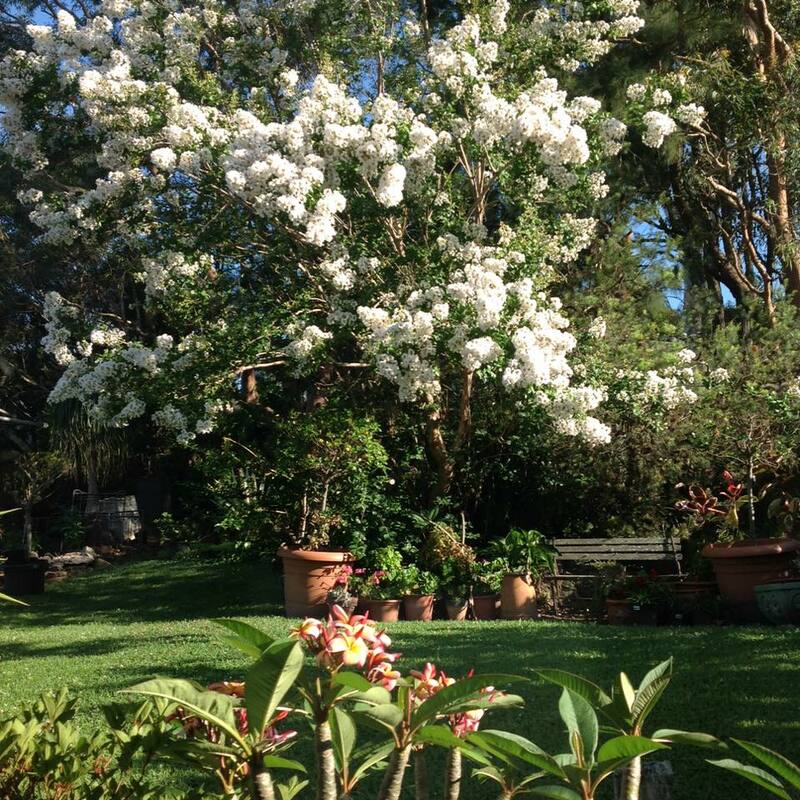 They do make great potted shrubs in generous sized pots, requiring minimal care. Potting them keeps them at a smaller size. 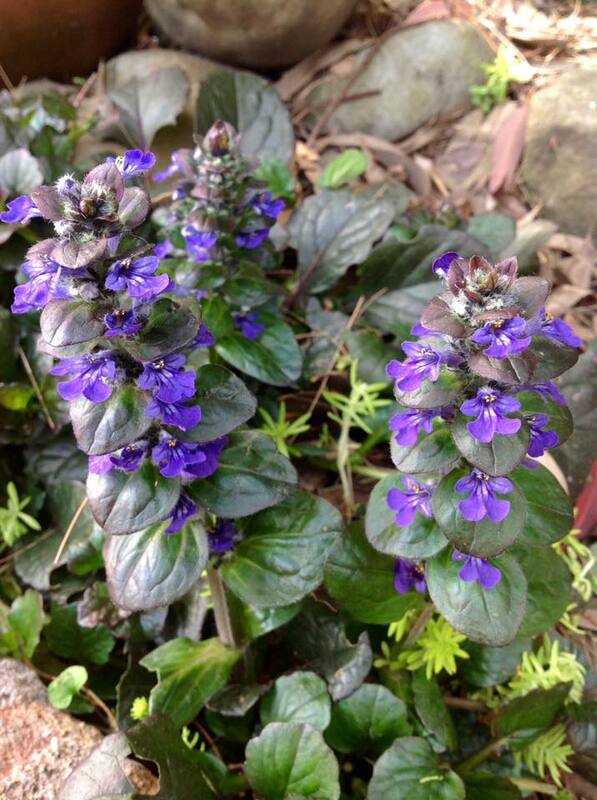 These go well in courtyards which have dappled light; as they do at my place. These are plants which should last for generations; even as pot plants. There are ‘umpteen’ varieties of Grevillea and the flowers are magnificent.. 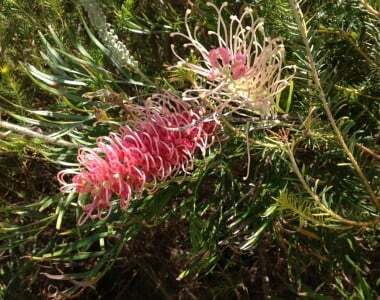 I like the ones with larger flowers which grow to about 1.5 metres, such as Robyn Gordon. 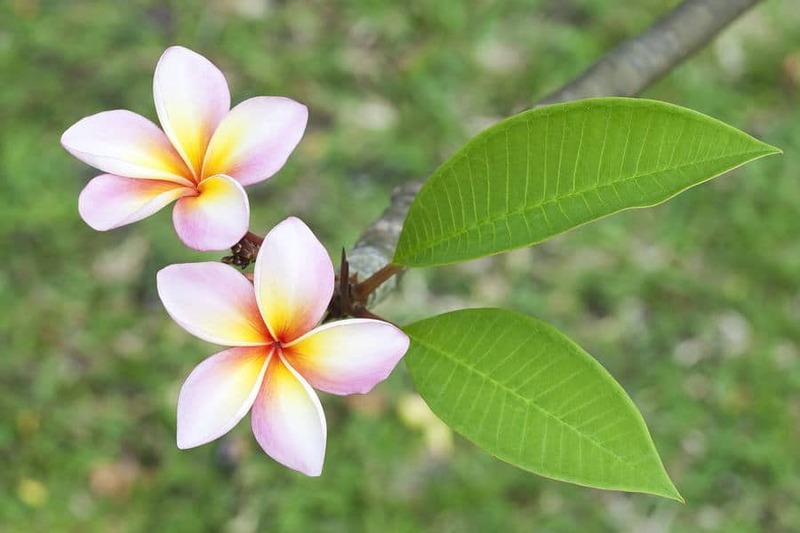 They will flower all year in full sun and should be kept in proportion and healthy with regular trimming. They are also bird attracting and very hardy. 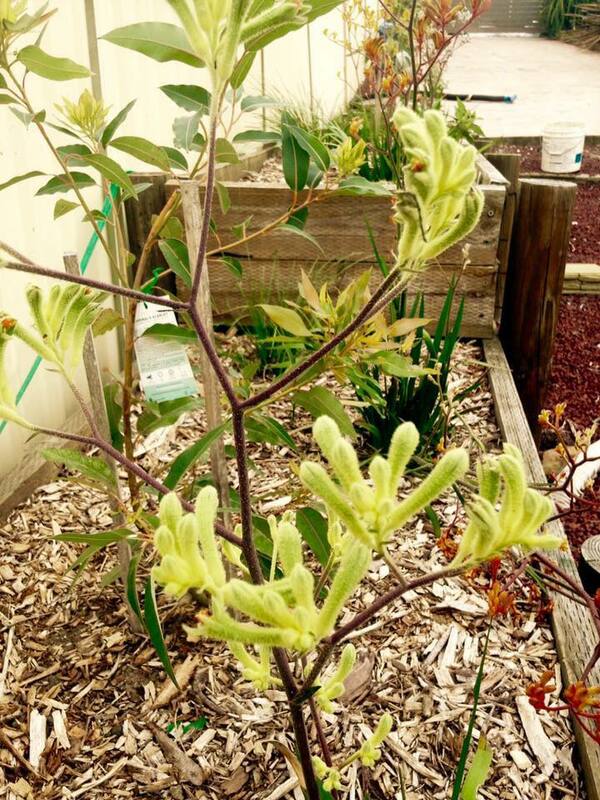 This plant can grow to 3 metres high but can be kept lower with trimming. 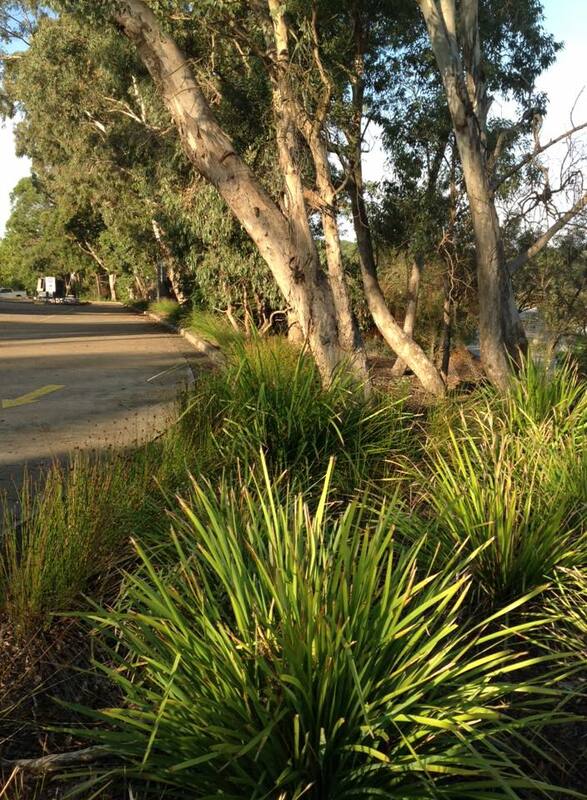 It makes a great hedge and is good on the coast (as it is salt wind tolerant). 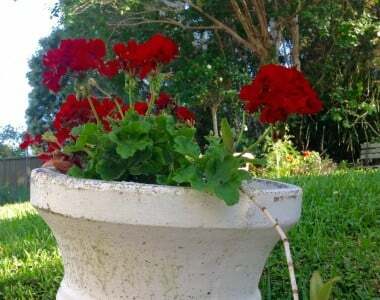 It can be used as a feature, or it can be planted in large containers. Fiji Fire is aptly named, as it has regular flushes of new red growth and orange pincushion flowers which are very bright. I’ve found it to be extremely hardy and reliable and prefer it to the all too common Photinia / Red Robin. These are bigger strap leafed bushy shrubs. Hystrix is more compact. 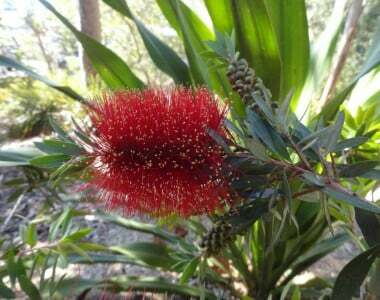 They have spiky flowers and you find them growing naturally along Australian creeks. 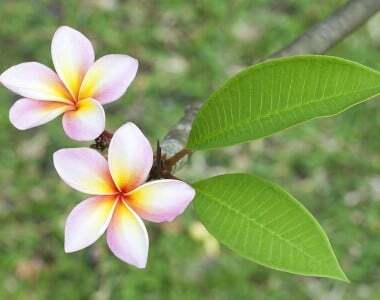 They also grow in a great variety of situations and are very tough; requiring almost no attention. Be aware that they bush out, so allow them some room. It’s a terrible shame that they are often trimmed back hard; which for me seems a waste of effort. 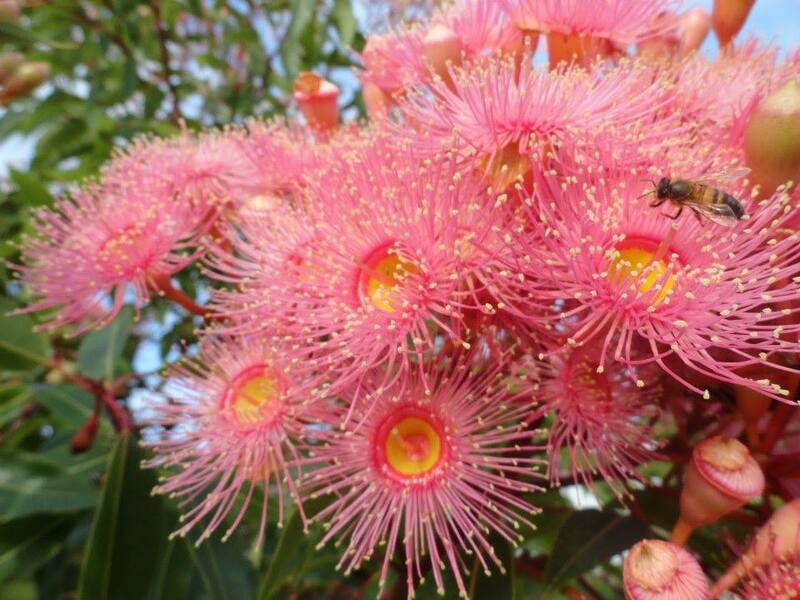 The flowers of these gorgeous trees come in many different colours and shades, from the classic yellow and white to pink, multi coloured and even red. They can eventually grow to the height of your eaves. It takes a long time though and they can be trimmed. 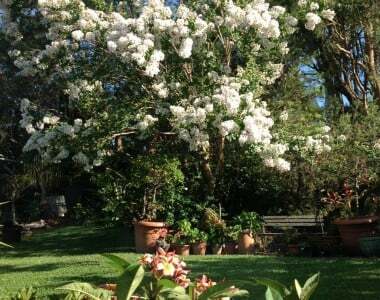 They go so well with older houses with small front yards and their scented flowers can be wonderfully fragrant; provided you find one which passes the sniff test. Never plant one until it’s passed the test. Yes, they are deciduous but they look sculptural in winter, as bare plants. 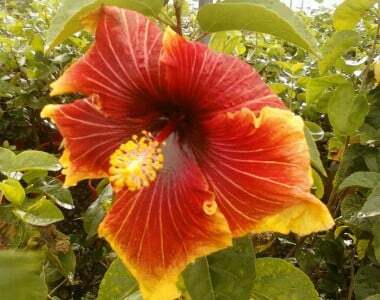 Deciduous plants help me to better enjoy the seasons and the flowers are worth the wait. 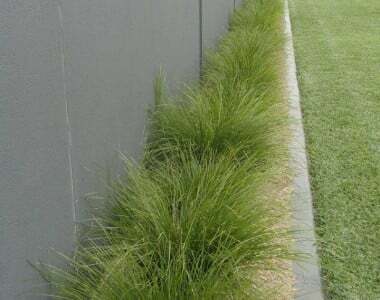 These are a native grass plant which has a compact green bushy look that will soften walls and borders, or they can just look good scattered about in a native garden. 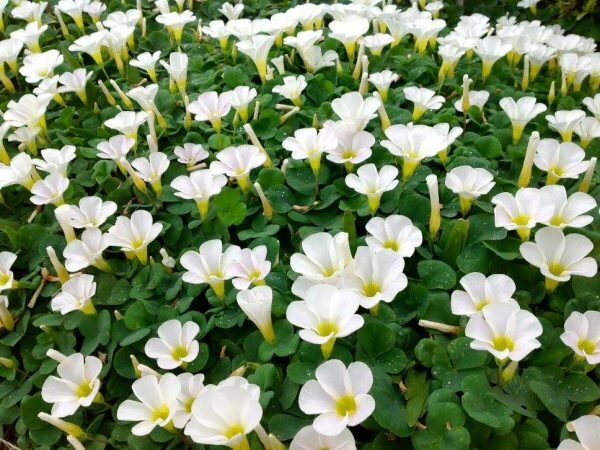 They will grow in all but dense shade and once established they require almost no watering. 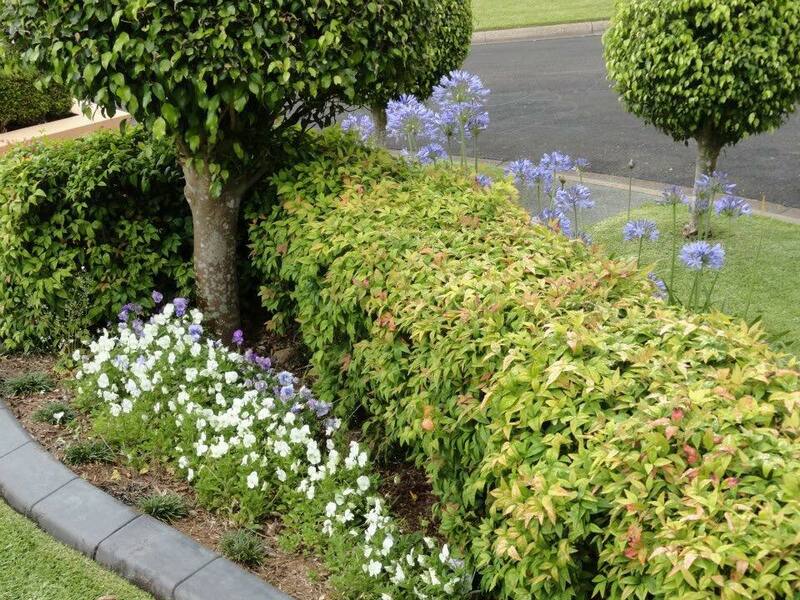 This is a bushy shrub which can be grown as an attractive low hedge. New growth is pink and it is a hardy, reliable plant without the pest problems of other Lilly Pilly varieties. 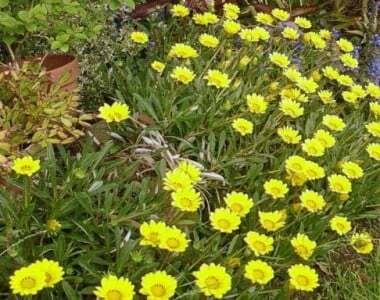 These low growing plants with daisy type flowers come in two different types; groundcover and clumping forms. 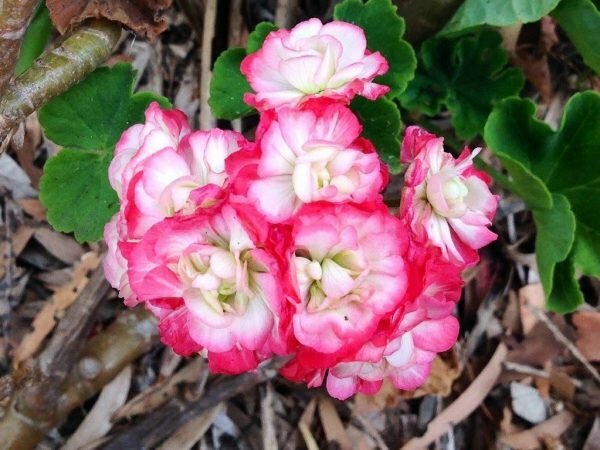 The clumping ones flower all year long and set viable seed which grows into more plants. The groundcover ones spread by growing and can be grown easily from cuttings. 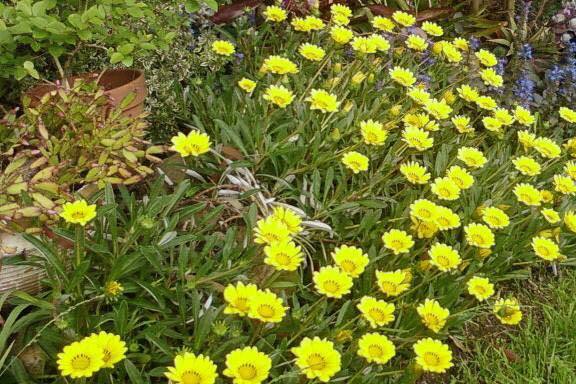 Lots of sunshine and good soil will give you the best results; though these can grow in dry gardens with little or no attention. At times, they can benefit from cleaning up dead material; especially after a lot of rain. 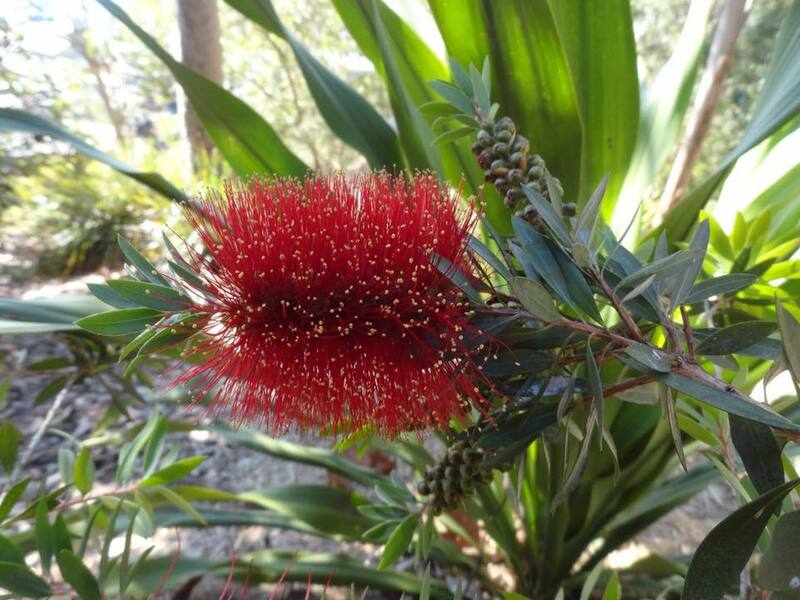 These tough plants can be a messy shrub in some situations but are usually very well behaved evergreen trees with bottlebrush flowers of all different colours; including pink, maroon, white,red and even green (Pinifolius, which is a local to my area of Lake Macquarie). 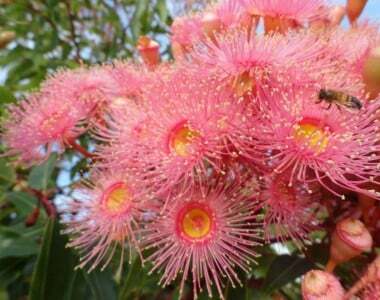 There are many different forms which grow from less than a metre to good sized trees. The birds love them; as do Flying Foxes (fruit bats). I had one which was supposed to grow to 4m and is more than double that. It was close to the house and made a lot of mess with fallen leaves. 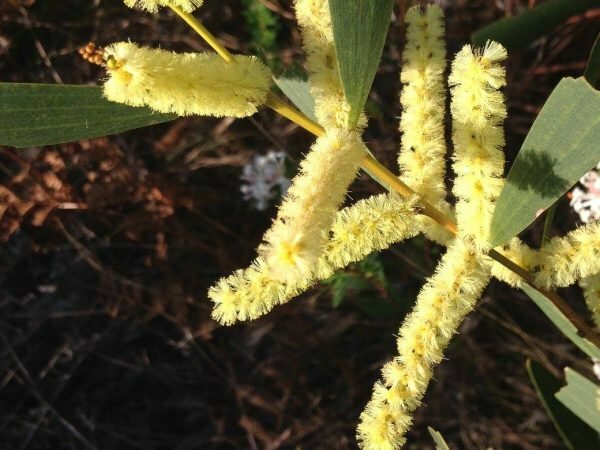 They go well in a native garden and do prefer areas which have good ground moisture but can tolerate long periods of dryness; especially if their roots are down into clay. 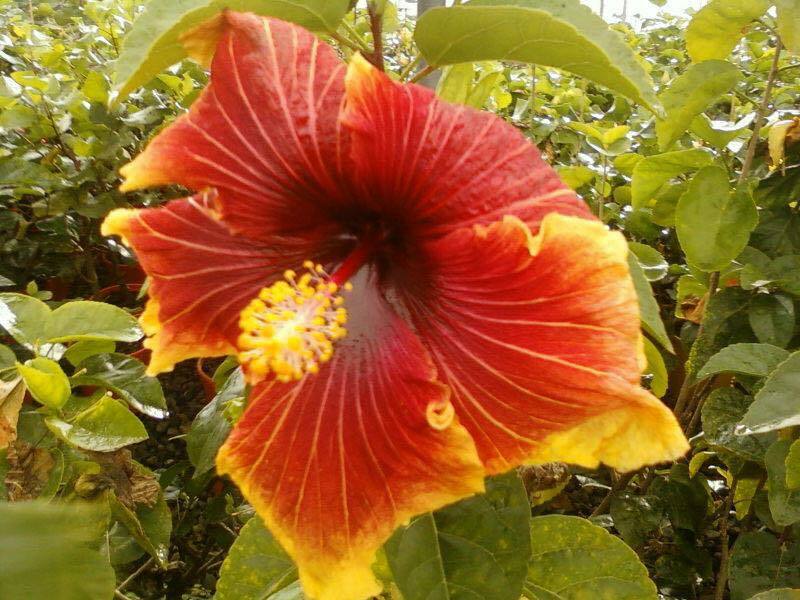 If you are after bright flowers of almost every conceivable colour and a tropical look, these are an incredible option. There are so many varieties. Although they are supposed to be gross feeders and needing a lot of water, I’ve seen them thrive in a garden which is never watered, apart from when it rains. Mulching around them is a good practice. 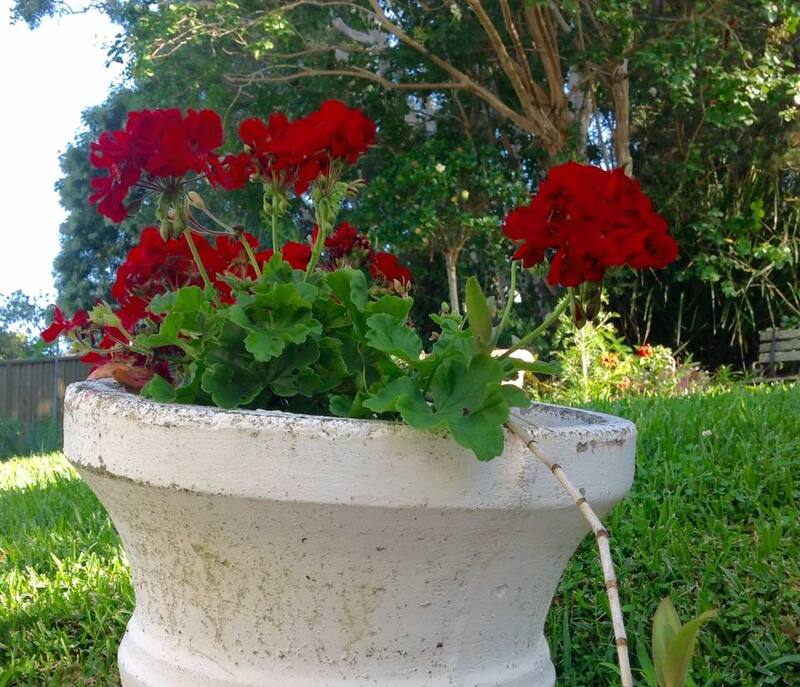 They can also be grown in containers and you can select lower growing varieties if needed. 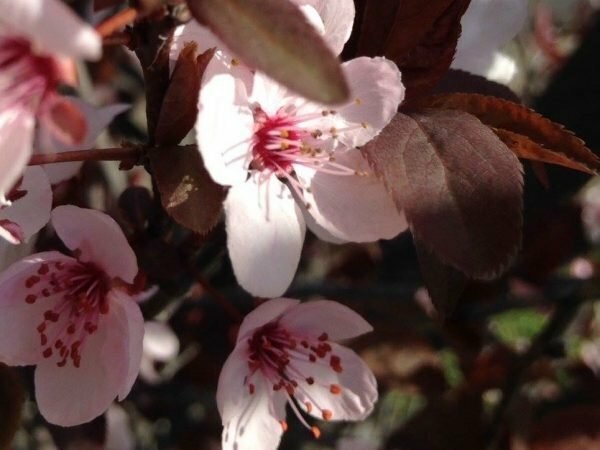 They benefit from an early spring prune and prefer good drainage. I’d reckon that this is one of those plants which has more information available on the internet than rose care. I’m not going to duplicate that here. So if you want to get right into them, you can open your browser and put your snout right in. You won’t be able to read it all. 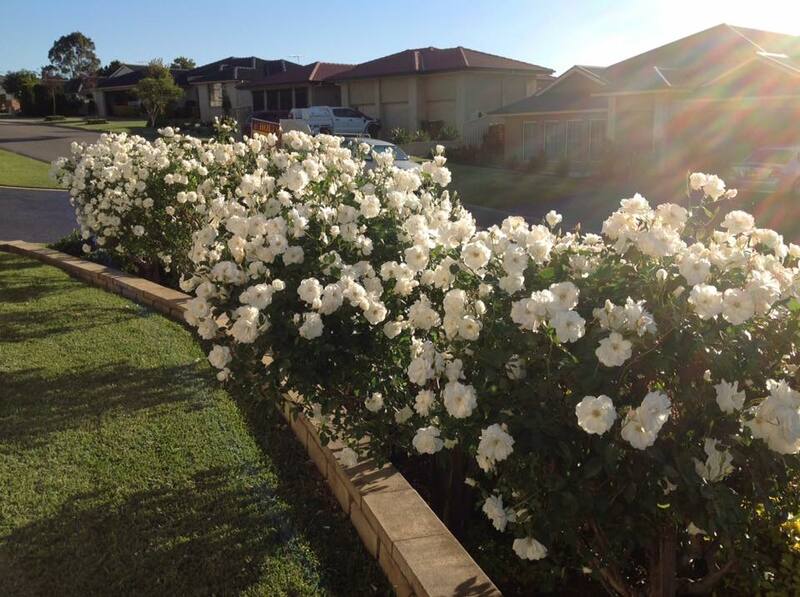 These come as bush roses or as standards. They also come in different colours & shades. Brilliant White and Brilliant Pink are my favourites. All roses are high maintenance, yet if these are grown in ideal conditions they provide high impact and gloriously scented flowers in great abundance, with minimal disease problems when compared to other varieties. They grow particularly well in drier climates such as in East Maitland.